TOKYO - Global shares stumbled Wednesday after another steep drop in the price of oil reinforced worries about the potential impact on the world economy of job cuts and reduced investment in the energy industry. France's CAC 40 inched down 0.2 percent to 4,276.23 and Germany's DAX was down 0.7 percent at 9,513.72 in early trading. Britain's FTSE 100 slipped 0.4 percent to 5,899.64. But U.S. shares were set to recover some of the previous day's losses. Dow futures were up 0.1 percent and S&P 500 futures rose 0.2 percent. Investors are worried about spillover effects from the slump in oil prices as major energy companies cut jobs and investment. Falling oil prices are also an added challenge for economies that are battling deflation at a time when both China and the U.S. are showing signs of faltering growth momentum. However, some analysts think there will be eventually be an economic boost from lower energy costs as the disposable income of consumers could be increased by several trillion dollars. "Falling oil prices have been one of the key drivers of negative sentiment in stocks. Two days of sharply weaker oil prices have refocused share markets on the potential problems flowing from the bear market in oil," said Ric Spooner, chief analyst at CMC Markets in Sydney. "Significant cuts in capital expenditure in the energy market are taking their toll on economies," he said in a commentary. "Markets are also concerned about the potential impact on credit markets that might flow from bankruptcies in the oil sector if oil prices keep falling." Japan's benchmark Nikkei 225 lost 3.2 percent to finish at 17,191.25. South Korea's Kospi slipped 0.8 percent to 1,890.67. 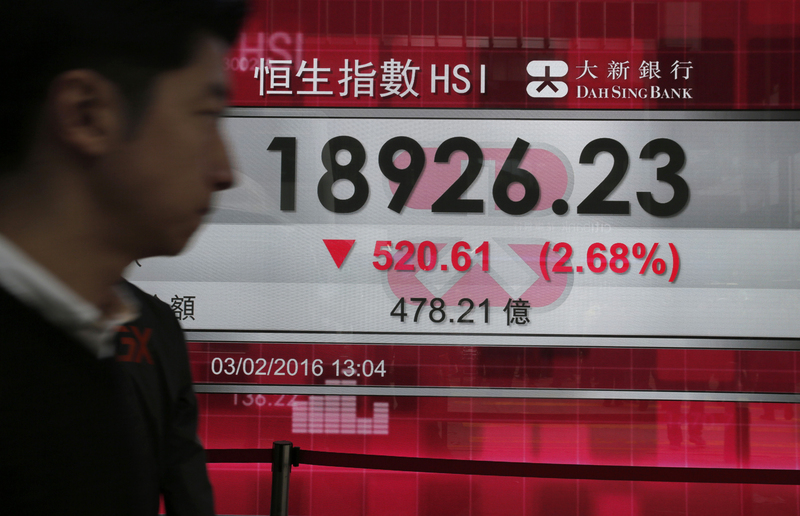 Hong Kong's Hang Seng was down 2.3 percent at 18,991.59 and China's Shanghai Composite fell 0.4 percent to 2,739.25. Australia's S&P/ASX 200 dropped 2.3 percent to 4,876.80. Markets also fell in Taiwan, Southeast Asia, India and New Zealand. Benchmark U.S. oil was up 29 cents at $30.17 a barrel in electronic trading on the New York Mercantile Exchange after being lower during much of the Asian trading day. The futures contract slid $1.74, or 5.5 percent, to close at $29.88 a barrel in New York on Tuesday; it fell nearly 6 percent the day before. Brent crude, a benchmark for international oils, rose 26 cents to $32.98 a barrel in London. It lost $1.52, or 4.4 percent, to $32.72 on Tuesday. The dollar fell to 119.93 yen from 120.81 yen the day before. The euro edged down to $1.0919 from $1.0925.